Matthew Wanat, Idaira Oliva and James Lechleiter are researching new approaches to substance abuse and its prevention. (July 31, 2018) -- Two collaborative teams comprised of researchers from UTSA and UT Health San Antonio have each been awarded a San Antonio Life Sciences Institute (SALSI) Innovation Challenge Grant for $100,000 to study novel approaches to substance abuse and its prevention. Matthew Wanat, UTSA assistant professor of biology and behavioral physiologist and James Lechleiter, professor in the Department of Cell Systems and Anatomy in the Joe R. & Teresa Lozano Long School of Medicine at UT Health San Antonio, are looking at how astrocytes could be targeted to help reduce a person’s cocaine use. Astrocytes are star-shaped glial cells that regulate the transmission of electrical impulses within the brain. “Astrocytes play a critical role in the duration of the cell-to-cell electrical signals in the brain,” Lechleiter explained. “Recent data in our lab suggest there are drugs that make astrocytes function better, which we hope will uncover a completely different means of treating addiction—with drugs that change how astrocytes function during cocaine’s effects on signaling. SALSI, a collaborative partnership established between UTSA and UT Health San Antonio by the Texas Legislature in 2003, has strengthened research in the life sciences, one of the fastest growing industries in Texas. Funding high-risk, high-reward studies could lead to the development of novel approaches in groundbreaking research, but this funding is difficult to secure. SALSI supports exactly this type of research that could have a translational impact on the $37 billion health care and bioscience industry in San Antonio and beyond and lead to extramural funding. “There is no FDA-approved treatment for cocaine addiction, so it is important to identify new potential targets to reduce cocaine intake,” Wanat said. 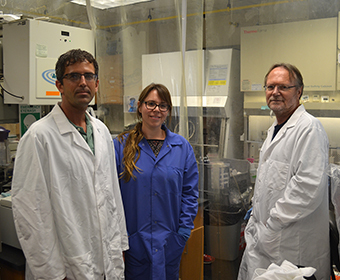 “The team is looking at a novel means to treat cocaine addiction and is leveraging Lechleiter’s work both at UT Health San Antonio and as co-founder of Astrocyte Pharmaceuticals. Jenny Hsieh, Semmes Foundation Chair in Cell Biology and director of the UTSA Brain Health Consortium and Daniel Lodge, associate professor of Pharmacology in the Long School of Medicine at UT Health San Antonio, are examining how to model addiction-related brain dysfunction using organoids. Organoids are brain cells that possess certain features of a human brain in the first trimester of fetal development, allowing researchers to explore how neurons grow and function. Lodge studies dopamine neuron function and its relevance to psychiatric disorders and opioid use disorders. He explained there are treatments for opioid use disorders like methadone, but researchers do not know what their effects are on pregnant women. “The goals for our research are twofold: look at the consequences of both opioids and of FDA-approved treatments on developing fetal brain tissue,” Lodge added. Texas State Senator José Menéndez, D-San Antonio, who serves on the Senate Committee of Higher Education, advocated for the legislation that created the San Antonio Life Sciences Institute in 2003. Senator Menéndez is committed to research and teaching excellence in the biosciences at San Antonio’s two leading higher education institutions which not only impacts his district, but the entire state. “Every day we can see the impact from the opioid epidemic on families and employers across Texas,” Menéndez said. “Together with others in the Bexar County delegation, I have advocated for funding of the San Antonio Life Sciences Institute to support research excellence at our two leading higher education public institutions. I’m proud to learn that scientists at UT Health San Antonio and UTSA continue to collaborate in pursuit of innovative approaches to discovering the underlying causes for substance abuse with the hope that eventually it will lead to non-addictive treatments for pain management."